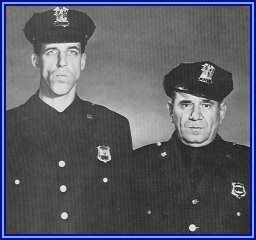 Jungle Red Writers: Classic Cop Shows..or are they? ROSEMARY HARRIS: I had every intention of making this post about classic cop shows on television, those no-nonsense ancestors of Law and Order and CSI when people wore hats and didn't look slightly frivolous like Maria Bello in the Prime Suspect. With few exceptions - mostly sports - everything I watch on tv is old. Reruns, if they are still called that (Help me, Hank...?) One day I may get a TIVO but I'm not there yet. I take my chances. It's inevitable PBS will rebroadcast the Bill Nighy film. So I was THRILLED when in a recent charity goody bag, in addition to the new biography of Steve Jobs, a tiny book on fashion by Christian Dior, and a wall calendar with pictures of France, there was a DVD called Crime and Punishment, premieres of, among others Dexter, the original Hawaii Five-O and one of my faves - The Streets of San Francisco. I couldn't wait to pop in the DVD. Michael Douglas was beautiful - that hair, those ties. A Quinn Martin Production! (No idea who Quinn Martin was.) Even Karl Malden, who'd been so brilliant in Streetcar Named Desire and On the Waterfront (I still don't get Baby Doll, though..) And the guest stars on this episode were Edmond O'Brien and Eileen Heckert, two fine actors from the 50's. You know where this is going. It was awful. A lot of running, shouting and shooting (at people they just wanted to question!) ridiculous dialog including this classic from a hospital scene when a doctor says, not once but twice "he's got a hole in him." I was crushed. It was almost as bad as the time I told a friend he had to read Narcissus and Goldmund and then I re-read it with, let's just say a less worshipful reaction than I'd had to it in my teens. RHYS: I'm always amazed at how corny and bad the dialog of some old shows was and how brilliant other shows were. The Streets of San Francisco I'd probably watch again because the husband of one of my best friends was an ex-cop who was used as an extra and then became a regular on the show with a few lines every now and then. My favorite of the old shows--Get Smart, I think. DEBORAH CROMBIE: If we're going for old cop shows, I think I have to cast my vote for Miami Vice. (Not the horrible remake!) Shallow of me, I know, but I love Michael Mann. And oh, those colors! Those suits (on the guys)! The stubble (on the guys)! The big hair (on the girls)! The shoulder pads (on the girls)! When have men ever looked so good, women so bad, and Miami so glam? And you can forget CSI Miami. Absolutely no comparison. HALLIE EPHRON: Car 54 Where Are You? 77 Sunset Strip? Starsky and Hutch? They were all dreadful, but I was in the teeny bopper generation the hunky guys were aimed at. So nice when Honey West came along. HANK PHILLIPPI RYAN: I have to admit--I had no idea who Honey West was. But! How about Hart to Hart? And The Prisoner! (Does that count? Or is that too new?) OH! I SPY. Terrific. And--what was it? Kolchak, the Night Stalker. And The Untouchables. Wasn't there a..like a series of detective shows, different from each other? Oh, my poor brain. Too much TV, I guess. ROSEMARY: Oh, The Prisoner, I loved it..but wouldn't even watch the remake on Sc-Fi Channel. Not a Jim Cavaziel fan.Honey West, yikes. how cute was she? All time fave has to be Hill Street Blues. I wonder what Pizza-man and what was her name..Joyce..are doing now? If it was a Quinn Martin Production, you could count on two things: big ugly Fords (early product placement!) and rotten dialog. For me, the best crime show of the 1970s is, hands down, "The Rockford Files." It's one of the few shows from that era that ages well. It also makes me wish that Jim Garner in his prime had gotten to play Travis McGee. I loved watching Quincy, MD, scripts weren't the greatest but loved his passion for justice. Wouldn't miss Lou Grant episodes - ahead of its time. Holy cow..Quincy, MD! Jack Klugman? Would love to see one of those again. I didn't know who Honey West was either, until our pal Ruth McCarty came dressed as her to the New England Crimebake banquet--very adorable! But what was the deal with the ocelot? The Rockford Files, oooh. My mother-in-law was head over heels for Jim Garner. That was one crush we could agree on. They weren't strictly cop shows (but neither was Honey West, right? ), but I loved Moonlighting and Remington Steele. Snappy dialogue, hot character interaction, and mysteries! What more could you ask for? I'm pretty sure those shows paved the way for books like Janet Evanovich's, et al. But I guess The Thin Man paved the way for the likes of Remington Steele. Moonlighting~! Remington Steele! Exactly, Karen! When I was thinking bout Hart to Hart, my brain kept thinking--there was SOMETHING else like that..and that's exactly what I was struggling to come up with! Roberta, Honey West had an ocelot. Why, I cannot say. (I considered being her for CrimeBake, I must say, and spent a brief amount of time calling toy stores saying: Do you have a stuffed ocelot you can gt to me by Friday?" It was pretty funny, and I soon gave up.) But Ruth (WITH ocelot) was knockout! But I didn't count that as a cop show. The Streets of San Francisco was worth watching mainly for the scenery of San Francisco and Michael Douglas's hair--both wonderful. I always thought Honey West was a lightweight, as was Barbara Bain on the original Mission:Impossible (although I collected some great arcane knowledge from that show about how to do various things, like cast a car bumber out of gold--yeah, I do that a lot). Obviously I watched far too much television when I was young--and look where it got me! Once in a while I think I should find old Moonlighting and Knight Rider shows from the 80s (my decade of reference). I mean, the Hoff and a talking car, saving the world together! And then I decide not to spoil the lovely memory I have of them with reality. Oh Moonlighting, Remington Steele--loved them. And The Prisoner... that was in a class by itself. It was filmed in a small weird Welsh village near where my relatives lived and every time I walk through the street I still expect to be followed by a big white ball. Oh, yeah, Sheila: "Kookie, Kookie, lend me your comb." 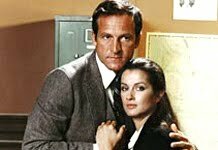 Ephrem Zimbalist, Jr. was such a hunk, and Stephanie Zimbalist's--of Remington Steele fame--father. That show made the then-unknown Pierce Brosnan's career as a leading man. Deb, I absolutely agree with you on Crossing Jordan. What a great show. And Miguel Ferrer as the head ME, too. I'm a huge fan of his. Bones is a pretty good one, as well. And by this time it almost qualifies as "classic", it's been on so long. Oh Spenser for Hire. The best. My son's middle name was chosen just for this. The Andy Griffith Show was probably more realistic than most of those. I think Andy Taylor invented the concept of community policing. In the Heat of the Night. I love my Southern Gothic. Oh my! What a nostalgia trip this has been. My mind was reeling with the difficulty of trying to narrow down to my favorite cop show just from the Facebook post I saw that led me to this blog entry. Then reading the entry and identifying so poignantly with the OMG how awful it was! reaction to seeing the belovedly-remembered program! Oi! . . . Oh, but THEN reading others' comments and being reminded of even MORE old favorites! . . .
"Remington Steele". Before the days of FB & Twitter to tweet your way through a show & texting on cell phones ... a friend of mine who lived a couple hundred miles away and I would race for our landline phones (the only kind there were, then) at the end of each episode to exclaim, "Did you see that?! Did you see when such-and-so happened?!" and just generally squeal our enjoyment of the show. . . .
And yes, Hank, there was a rotating mystery show. It was a weekly Mystery Movie. I think perhaps it started out as the Sunday Mystery Movie and then later became (or did the network add an additional?) the Wednesday Mystery Movie. I think there were 4 shows so that each one aired roughly once a month as a 2-hour TV movie: Macmillan and Wife. Colombo. McCloud ("There you go!") And ... oh c'm'on, I know there was a 4th. Did "Rockford Files" start out on that before becoming a weekly series all its own? Can't remember the 4th. . . . Anyway, I always thought the format made worlds of sense: more time for scripts, production value, everything about the show improved over the scramble to put out a one-hour episode every week; I truly thought more shows should've been done that way. Especially the science fiction attempts that didn't last long on the then-all-powerful networks would've benefited by only having to produce something once a month instead of once a week. . . .
::sighs:: I still haven't figured out which to say is my favorite old cop show, but this stroll down Memory Lane has been such a hoot! Thanks, folks! Columbo, Murder She Wrote, Hawaii 5-0 (the original, of course), Magnum PI...but I liked watching I Spy reruns. Going back even further...the Avengers series - Diana Rigg sure looked different then! Oh, Starsky and Hutch. That was my favorite show. I used to scribble pages and pages of Starsky and Hutch fanfic in my spiral-bound notebooks - usually stories where I was Starsky's little sister and I helped them solve cases and then got into TERRIBLE danger and at the last minute Hutch would rescue me. Sigh. Thank God there was no internet around when I was 12, or those things would still be out there. I haven't rewatched any of the original series, but I loved the movie remake with Ben Stiller and Owen Wilson. Some of those shows are just horrible in retrospect (Buck Rogers and Tweaky the Robot, anyone?) but others have held up well. When the updated version of V came out, I went back to watch the original miniseries. Guess what? Despite having a special effects department that consists of a guy in a rubber suit, the 1980's show was much better written - and a lot more suspenseful. Oh Julia, I love that you wrote as Starsky's little sister--would pay good money now to read those stories! Y'all know that Efrem Zimbalist Jr. has a Quinn Martin connection - QM produced "The FBI" which ran on Sunday nights. My mother loved EZ and was thrilled to find out that I used to see him at the baggage claim up here in CT at the airport. I was so upset that I didn't recognize Honey West at Crime Bake because I LOVED her show. Honey and Emma Peel were great role models. I often wonder how much impact they may have had on the women's movement? Actually, my fave that I have trouble watching now is The Man From UNCLE. The B&W shows still stand up pretty well. When the show hit it big and went to famous guest stars, they started camping things up and got stoopid. Still, UNCLE is the show that made me want to be a writer. I wrote and illustrated MFU stories with pencil and crayon sketches. (I've noticed how NCIS Ducky's nose has shifted over the years because I used to draw it with painstaking care.) I used to follow script writers names like other kids followed ballplayers. Does "Wild, Wild West" count? Jim West and Artemus Gordon were Secret Service agents solving mysteries for Pres Grant. I had such a crush on Robert Conrad! My hubby got me the complete collection for my bday this past Sep and we've been watching them all and, of course, they're dreadful, but so fun. My 12-yr-old daughter is enjoying them. And the theme music still gets me. 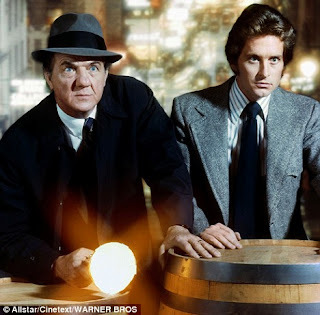 Except for Hill Street Blues, I was not big on cop shows. Although, I did like Car 54. I liked legal dramas the best. LA LAW was a fave. And until my children started watching it 24-7 and I couldn't stand it anymore, I used to like Law and Order, the original one - not the special crime units. I'm enjoying the mental image of Rhys trying to escape a big white ball. So Lucy on HSB did you have a favorite? I loved Bobby Hill. Whatever happened to those guys? Assuming that The Man From U.N.C.L.E. doesn't qualify as a "cop show," I'm going to have to join with those who cite Hill Street Blues. Mick Belker is still one of the greatest characters in television history. Hill Street was a Thursday night stable. Julia, I wrote Starsky & Hutch fanfic, too, but Hutch was NOT my big brother! Miami Vice. I have the whole series on DVD. Hart to Hart. MacMillan and Wife. Wild, Wild West. 77 Sunset Strip. Naked City. The FBI. There was another show in the 80s, a British import, Bergerac, staring John Nettles before he went on to star in Midsommer Murders. LOVED that show. It was set on the Isle of Jersey. *sigh* SOOOOO good! Oh, heck! How could I forget Angie Dickerson in Police Woman. She's why I wanted to be a cop when I grew up! This brings back fond memories--of when I never, ever watched TV. Have never seen any of the shows mentioned. I think I watched half an episode of Miami Vice once. The others I've never seen at all. They didn't sound all that great then and it sounds like they haven't improved with age. I loved Wild Wild West, too, Laura -- Sure they count - secret service agents, old west. Such a smart show, as I recall, and I LOVED Ross Martin as Artemus Gordon. Do they hold up? Hi Hallie--Glad to know I'm not the only WWW fan (and that's not a wrestling show). In some ways they hold up--Jim West had a six-pack back when Captain Kirk looked a bit soft--but the stories are very formulaic and a bit too anti-woman for me. There's ALWAYS a devious, deceitful woman and every woman who comes on screen ends up kissing West after very little or no interaction. The plots are silly. I still enjoy the humor, the train, and the James Bondish weapons/gadgets. Oh, and did I mention the abs? "People. Be safe out there." Wasn't Wild Wild West the first instance of steampunk? Deborah, I'm with you on Miami Vice (the original series, not the awful remake). My son gave me the first season on DVD a few Christmases ago, and Ben and I watched it, amazed that it stood up as well as it did. Love that Tubbs! Also, Cagney and Lacey with Tyne Daly and Sharon Gless. The first married with kids policewoman. What fun to remember all these! Peter Gunn. The plots were sure thin, but I loved the jazz. That was so modern then! Remember Mannix or Have Gun Will Travel? Maverick & Rockford Files (Jim Garner in anything), Wild Wild West (Ross Martin! ), Perry Mason, Colombo, McMillan & Wife, Remington Steele, Moonlighting. Loved Columbo. I also love Hawaii Five O!! Book 'em, Dano!